So here it is... one month after I started this A-to-Z challenge and I've essentially written an adventure one post at a time. And so, there's nothing left but the map. So... here 'tis! Be forewarned, there will be some inconsistencies between what was written over the last month and the map that appears here (and is downloadable via the link below). Also, I know there is no legend on the map, but each square equals 5' and when reading the type in its proper orientation, the "top" of the page is north. Also, the map is "incomplete" to some degree; for example, you will note some rooms have specific floor tiles that are marked. 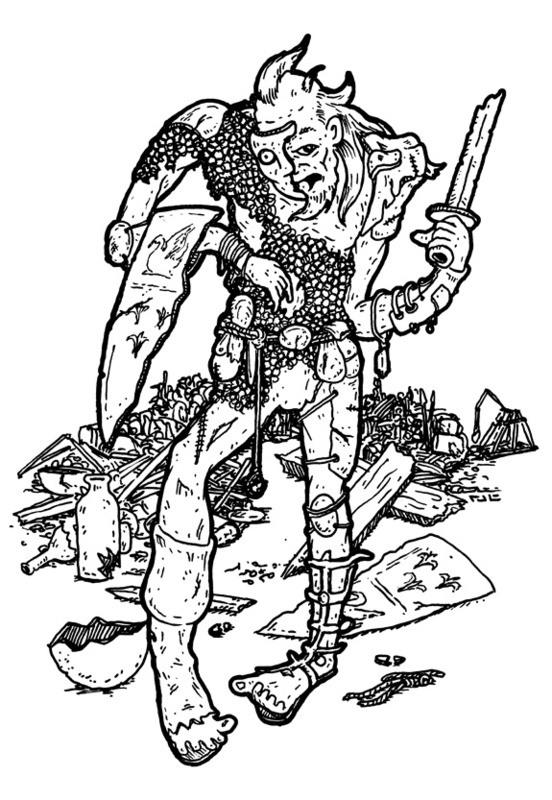 The intention at some point is to have additional support images within the DM's encounter descriptions, as well as having a set of player "handouts" (via an "illustration booklet" a la Tomb of Horrors). 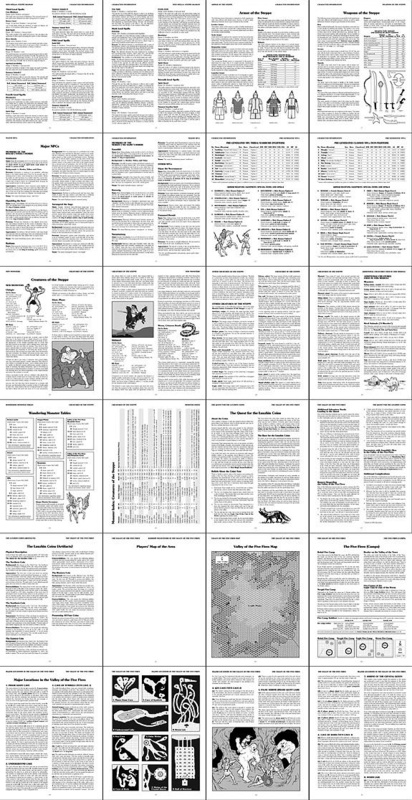 Please note the PDF is 2 pages and contains both of the pages previewed below. 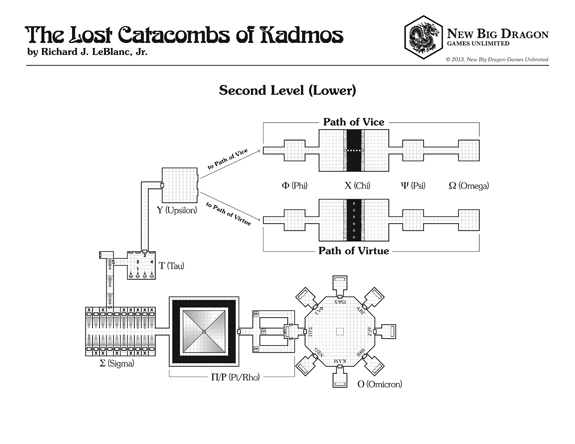 to the Lost Catacombs of Kadmos (from MediaFire). For information on the "dual track" encounters below, see Upsilon (Υ): The Paths of Vice & Virtue. Please note, the choice of paths was phrased in such a way as to make it ambiguous which path is the path of virtue and which path is the path of vice (from the POV of the PCs). At the far end of the room, a woman in a long, shadowy gray toga sits perched on the front edge of a large stone chair, her eyes trained on the entrance to the room. "I am the Omega Maiden, a caretaker of the catacombs. Kadmos has granted you each an egg of treasure. Choose the one you desire, oh hero." 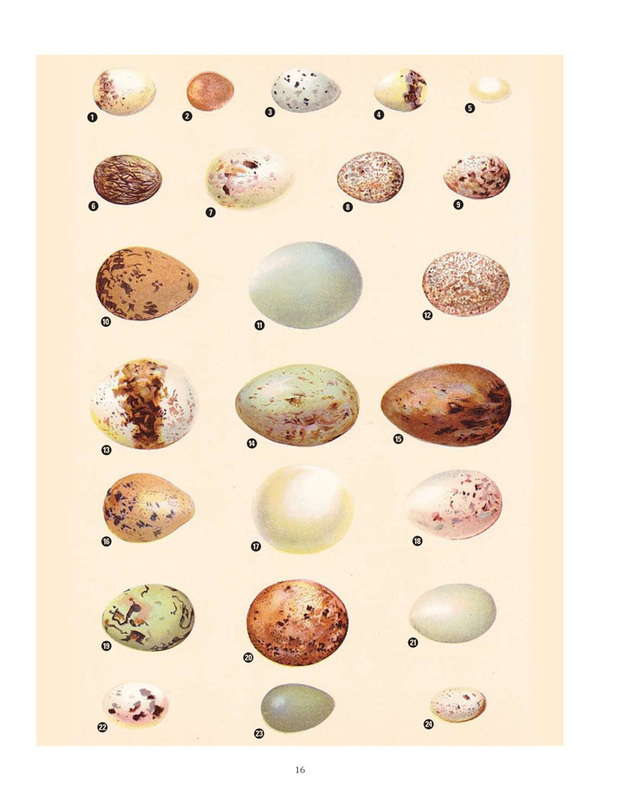 You survey the perimeter of the room and see two dozen doric pedestals, each topped with a simple nest of branches and twigs that cradles an egg of various proportion and color. "The treasures are your rewards from Kadmos for choosing this path." The eggs may be touched, lifted, examined closely, etc., but will each feel light as a feather and seem "empty" (hollow). 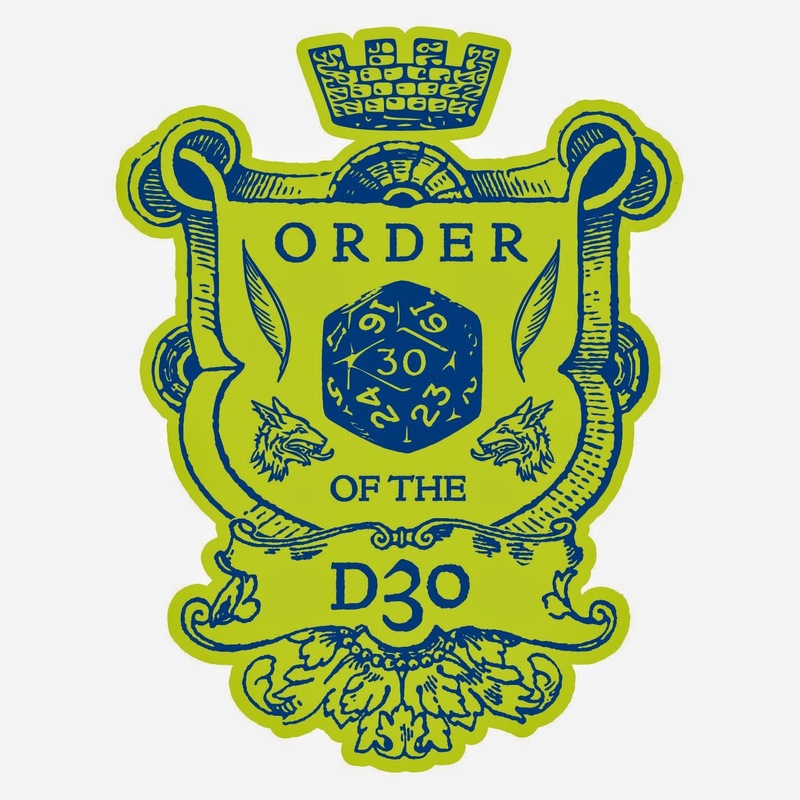 Each time a character picks up an egg, that character must roll their dexterity or lower on 3d6 or the egg will crack and thus be considered "opened" per below. The eggs may be moved from nest to nest without any repercussions (except as noted above). When a character opens or otherwise cracks an egg (on purpose or accidentally, even if not in their hands at the time), that character (and the eggshell) will immediately be teleported to a random location somewhere in a 100-mile radius of the catacombs. Once transported, that character will find the magic item (cursed) which has been granted them (per the egg they choose on the Eggs of Vice chart) laying on the ground in front of them next to the shell fragments. None of the party members will be transported to the same location as another. 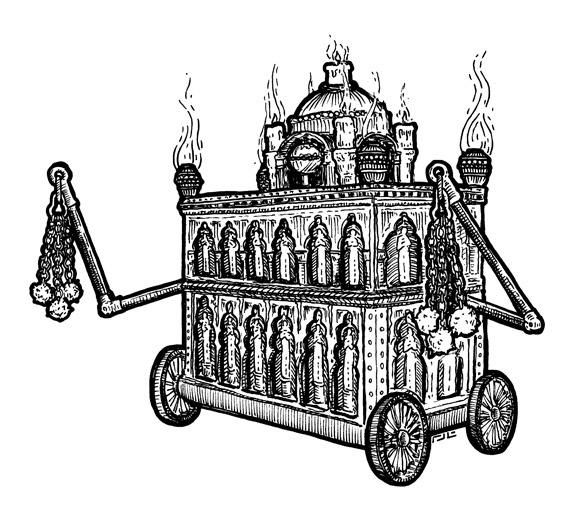 If anyone takes more than one egg, attempts to open more than one egg at a time (e.g., by slicing them open with a sword), or attacks the female caretaker, each member of the party will be transported to disparate locations throughout the 100-mile radius of the catacombs (as above). At the far end of the room, a man in a gleamingly clean toga sits deep into the back of a large stone chair, his eyes staring blankly into space. "I am the Omega Man, a caretaker of the catacombs. Kadmos has granted you an egg of knowledge. Choose wisely, my friend." When a character opens or otherwise cracks an egg (on purpose or accidentally, even if not in their hands at the time), that character (and the eggshell) will immediately be teleported outside the entrance to the catacombs. 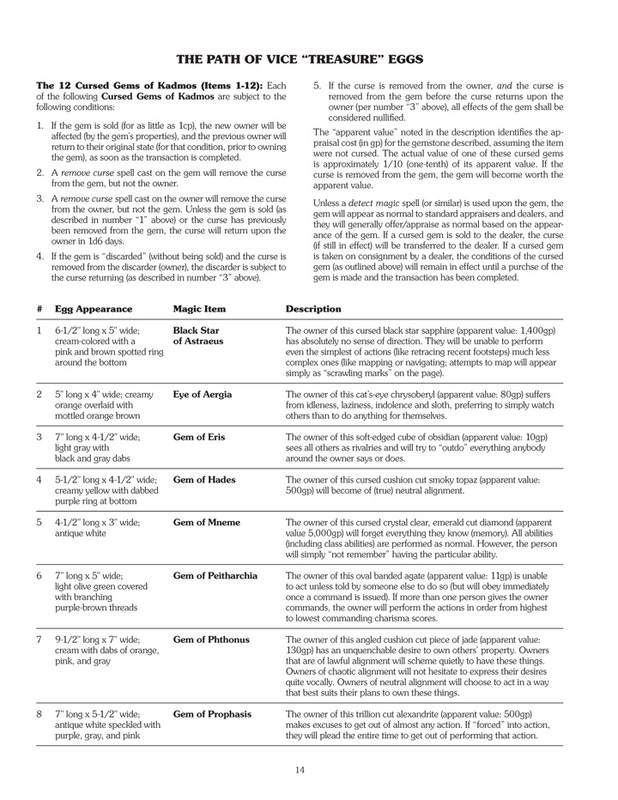 Once transported, that character will possess the magical boon granted them (per the egg they choose on the Eggs of Virtue chart), with the shell fragments on the ground at their feet. If the boon is a physical one (e.g., a ring) it will be on the ground with the shell fragments. 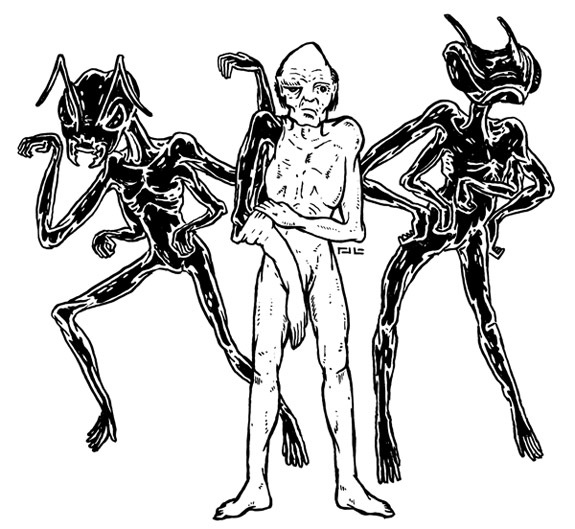 If anyone takes more than one egg, attempts to open more than one egg at a time (e.g., by slicing them open with a sword), or attacks the male caretaker, every member of the party will be transported to disparate locations throughout the 100-mile radius of the catacombs (as Omega Maiden & Ovoids on the Path of Vice). and the complete map of the catacombs on Tuesday. For information on the "dual track" encounters below, see Upsilon (Υ): The Paths of Vice & Virtue. The center of this massive 60' wide by 100' long room is broken by a similarly massive chasm, creating two distinct areas of the room... the area where you are, and the area where you need to get. The chasm is 40' across, 30' deep, and runs the width of the room. 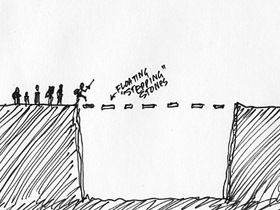 Spanning the chasm, spaced at approximately 5' apart, are a series of 7 “floating” stepping stones that appear to allow passage across the chasm. Any time a creature/character steps on one of the stepping stones, all creatures and characters to the south of the chasm in rooms Chi and Phi (as well as the adjoining hallways) will take 1 point of damage on a failed saving throw vs. spells (for each step taken). Nothing will happen if inanimate objects are placed/thrown onto the stones. The walls of the chasm are moderately easy to climb and all attempts to climb (sheer surfaces) are performed with a +5% bonus. Falling into the chasm does 3d6 points of damage per 10' fallen. The center of this massive 60' wide by 100' long room is broken by a similarly massive chasm, creating two distinct areas of the room... the area where you are, and the area where you need to get. The chasm is 40' across, 30' deep, and runs the width of the room. Hanging from the ceiling (about 40' above the center of the chasm) are 6 hooks (spaced about 5' apart) that appear strong enough to sustain you should you attach a rope and swing across one by one. All of the hooks are designed to seem sturdy when pulled from the “starting” side of the chasm, but come loose as anything hanging from the hooks moves to the “ending” side of the chasm, causing anything suspended from the hook to fall into the chasm. A wizard lock spell will hold the mechanism in place, assuming the spellcaster can get within the appropriate range of the mechanism for the spell to be effective (e.g., if someone attaches a rope to one of the hooks and pulls with enough force to allow the spellcaster to climb the rope); standing on the very edge of the chasm directly in front of a hook will place a spellcaster approximately 45’ from the hook’s mechanism. The walls of the chasm are easy to climb and all attempts to climb (sheer surfaces) are performed with a +5% bonus. Falling into the chasm does 3d6 points of damage per 10' fallen. 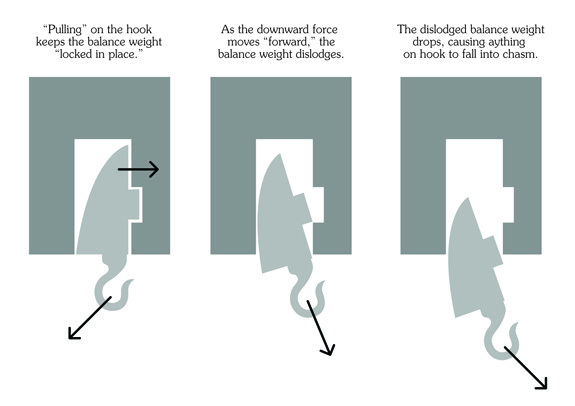 Falling into the chasm from a rope (on a hook that has dislodged) does 3d6 points of damage. Once the PCs have chosen Path of Vice or the Path of Virtue, they will be transported to one of two "parallel tracks" of rooms, each nearly identical in appearance to the corresponding room on the alternate track. The obstacles they will face through the rooms (as well as the rewards at the end) are tailored to the "treasure" they seek (per the choice presented to them in the Upsilon chamber. At the end of the hallway, you find yourself at a room measuring approximately 30' wide and 30' feet across. The wall to your left features a fresco of seven wild-eyed warriors slaughtering a bull over a black shield, and the wall to your right features a fresco of the same seven warriors with their left hands submerged in the bull's entrails and their right hands raised high, as if enthusiastically taking an oath. 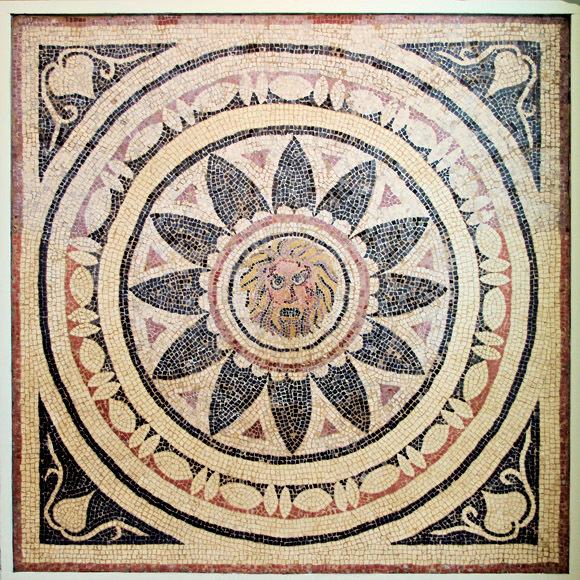 The entirety of the floor features a mosaic of a bearded male with a menacing look in his eyes. You're not sure if it's the gory attention to detail in the frescos, or something else entirely, but you get a very bad feeling about this room. You can't wait to get through this room and through the door on the other side of the room. Any character that walks across the mosaic and exits the doorway on the other side must save vs. spells or be filled with fear for 1d6 turns. Upon their failed saving throw, each affected character will hear a voice whisper (inside their head), "Welcome friend of Phobos!" Affected characters will want to get away from this area as quickly as possibly, proceeding into the "Xi" chamber. The effects of the fear will almost assuredly cripple their actions in the next room, making them unable to perform any actions that will even remotely cause themselves harm (like cross the chasm and risk falling in). At the end of the hallway, you find yourself at a room measuring approximately 30' wide and 30' feet across with a door on the wall opposite you. The wall to your left features a fresco of seven proud warriors sacrificing a bull over a black shield, and the wall to your right features a fresco of the same seven warriors with their left hands submerged in the bull's entrails, their heads lowered, and their right hands raised in honor, as if taking an oath. The entirety of the floor features a mosaic of a bearded male with a menacing look in his eyes. You're not sure if it's the gory attention to detail in the frescos, or something else entirely, but you get a very bad feeling about this room. The first person to cross the threshold into the room will gain a +2 bonus to all "to hit" and damage rolls for the duration of 1 hour. Furthermore, all class-related skills for members of the thief class (or sub-class) will function at 2 levels above normal for that same duration (e.g., a 1st-level thief will perform all thieves' abilities as a 3rd-level thief for that duration). The second person to cross the threshold into the room will gain a +1 bonus to all "to hit" and damage rolls for the duration of 1 hour. all class-related skills for members of the thief class (or sub-class) will function at 1 level above normal for that same duration. On the far wall of the room are two identical doorways, each framed by a pair of doric columns and topped with a frieze featuring a menacing face set on a triangle pointed downward. The surface of the plane where each door would be swirls with marbling curls of smoke. These appear to be more than simple doorways and appear, instead, to be portals of some sort. The face collapses into the wall and disappears. The portal on the left will transport those who enter to the Path of Vice. The portal on the right will transport those who enter to the Path of Virtue. Once through the portals, there is no returning to this area, except by the single entrance through which the PCs entered (accessed via the front length of the catacombs). Down the wall to your left are four pedestals. On the top of each pedestal rests a stone tablet that features a primitive drawing of some sort. In front of each pedestal is a lever. On the wall directly across from each pedestal is a door. It would seem that the four pedestals/tablets/levers coordinate somehow with the four doors. The four doors are all locked, but three of them are "false" doors and when opened (after being unlocked) will only reveal the wall behind them. All four doors may be unlocked by standard means, but trying to break down the false doors will do 1d2 damage to anyone attempting to do so; also, any attempt to break down the door will do nothing to unlock the door. 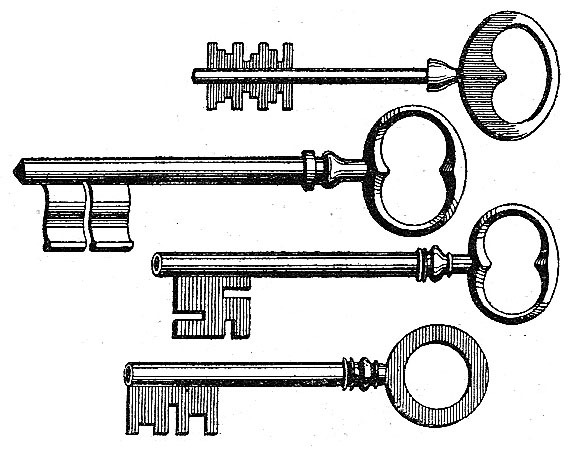 Although it is natural to assume that the traps and levers have something to do with the locks on the doors, they have no correlation. (1) Swinging weight trap: This trap affects those of elf-height or taller who are standing in the target location. Ducking or crouching, or creatures shorter than an elf will be unaffected. (2) Dropping weight trap: This trap affects any creature standing in the target location. (3) Pit trap: This pit is 10' deep and affects any creature(s) standing in the 10'x10 target location. (4) Fireball trap: The fireball is released from a hole in the ceiling directly above the target location and does 1d6 flame damage (on a failed saving throw vs. breath weapon) to any creature(s) standing in the 10'-diameter target area. Before you lays what appears to rows of staircases leading off to the left and off to the right. There is no apparent way out in front of you. At the top of each stairwell is a locked door, but the doors lock "from the outside" (PCs' side). Each of these doors opens a "closet", many of which contain a skeleton armed with a sword and shield which has been locked inside (denoted by an "X" on the map of this area). Many of the stairwells are actually slide traps which will release when the door at the top of the stairwell is opened. Any skeleton inside a closet at the top of a slide trap will gain a +2 bonus to its initiative roll. The slide trap in the stairwell behind the secret door to the east (beyond the 7th stairwell to the right) is triggered by stepping on the next to last step (just before the stairs end and the hallway turns to the north). Secret doors exit the Π/Ρ/Σ ossuary to the left and right of the entry, as well as behind the shelving unit against the back wall. To access the secret door behind the shelves, the shelves must be moved but they are also trapped. Moving the shelving unit will pull a "trip wire" that causes the stones of the ceiling to fall, doing 1d4 damage to anyone standing inside the ossuary. Down the secret passages are pressure plates in the floor. When 10gp weight or greater is placed on any of these plates, the plate will be triggered, accompanied by a "click." The two "flanking" pressure plates each send a blast of flame down their respective hallways that does 1d6 points of flame damage (on a failed saving throw vs. breath weapon). 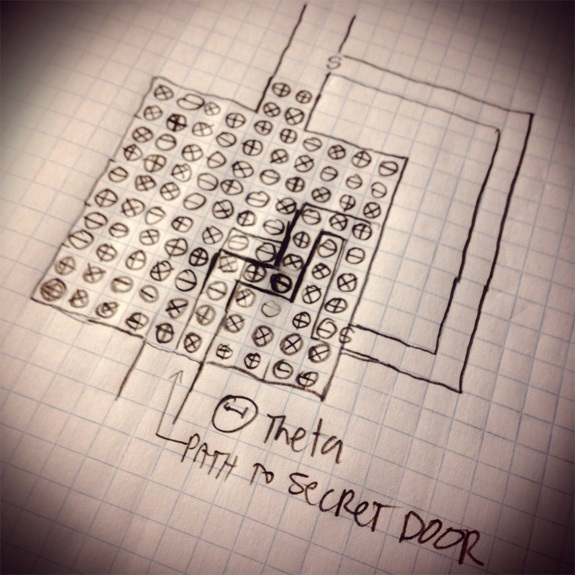 The pressure plate down the central hallway locks and unlocks the door to area Π/Ρ (Pyramid Room). 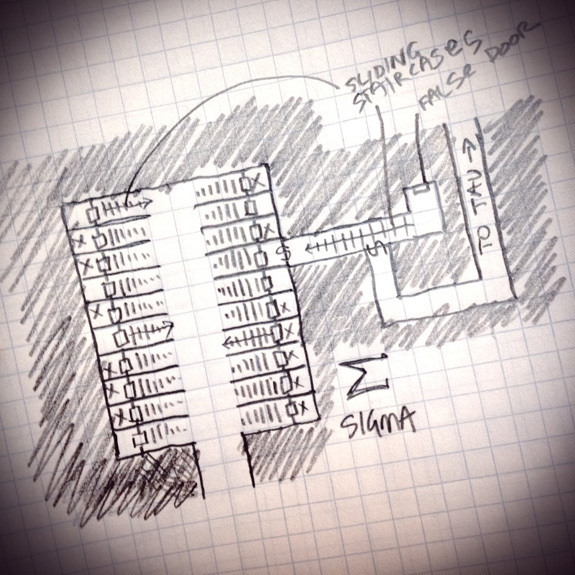 Additionally, the closer the PCs come to the door to the Pyramid Room, the hotter the temperature will get (the area just outside the Pyramid Room door is about 20° warmer than the Π/Ρ/Σ ossuary). When you first enter this area, even the largest members of your party feel dwarfed by the massive limestone pyramid before you, approximately 80' across at the base, 50' tall, and floating over the middle of an 90'x90' wide pit that appears to be bottomless. A 5' wide walkway lines the perimeter of pit and allows a 360° look at the pyramid. The longer you stand in this room, the warmer it seems to get. After a moment, you realize that the capstone of the pyramid is constructed with some kind of "hinge," and the hinged stone is "open." Closing the "cap" of the pyramid will do 2 things: 1) it will return the temperature in the area to normal, and 2) it will open a passageway through the wall to the north.Due to the heat of the pyramid, as well as the smoothness of the stone, there is a -10% penalty applied to climbing attempts. Furthermore, anyone climbing the pyramid will take 1d4 points of heat damage for each turn spent in direct contact with the pyramid while the capstone is "open." Anyone with infravision or a similar ability will be able to detect the passageway just beyond the stone wall. 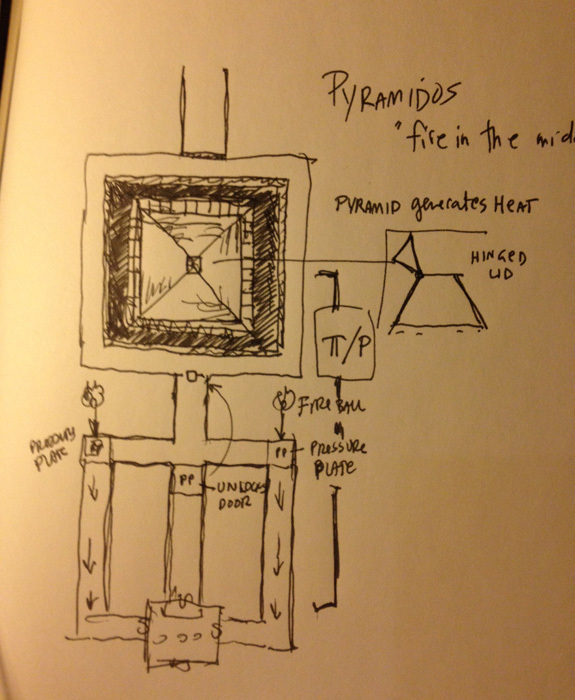 The inside of the pyramid is filled with a magical, eternal fire and extinguishing it would be nearly impossible for a group of low-level characters. Anyone that attempts to look "into the fire" (through the open capstone) will be blinded for 3d6 turns. The "bottomless" pit is actually illusionary and is, in truth, only 20' deep. Anyone falling in will take 2d6 points of damage. You descend from the vertical passage and enter an octagonal room approximately 100' in diameter. surrounding you are four stone altars, and each face of the perimeter wall features a heavy iron door. Starting from the northernmost door, each door features 3 successive letters of the Greek alphabet; door 1 features the letters alpha/beta/gamma, door 2 features the letters delta/epsilon/zeta, and so on through to door 8 which features the letters chi/psi/omega. Each of iron doors opens to reveal a 10'x10' ossuary guarded (inside) by three skeletons. 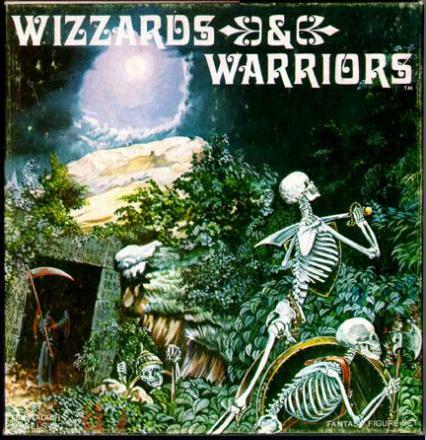 Each skeleton has a sword and a shield which bears one of the letters from the iron door. On the far wall facing the entry is a small set of shelves lined with a mix of human skulls, used/dripping candles, sooty wooden incense bowls, chips of bone and clay, and small clay urns of various proportion (each of which holds some degree of ashen remains). This room is tiled floor to ceiling in immaculately white 5'x5' marble tiles. Several of the floor tiles are engraved with the symbol for the letter Xi ("Ξ"). Each of the marked tiles is actually a trap door. 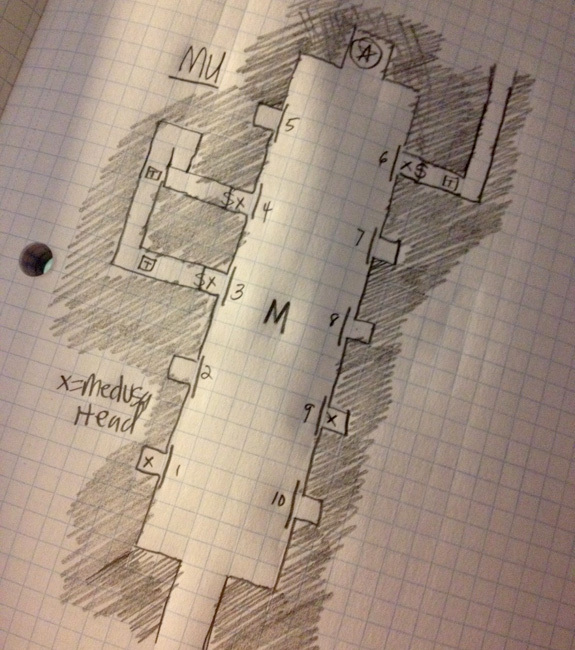 Under each trap door is a skeleton armed with a sword and shield that attacks with a +1 initiative bonus. In the far left corner of the room, the unmarked floor tile is actually illusionary, and disguises a 5'-cubed crawl space beneath it. Any one stepping on the illusionary tile (unaware it's illusionary) must roll their dexterity or under on 3d6 or they will sprain their ankle (slowing their movement to 1/2 normal until healed). 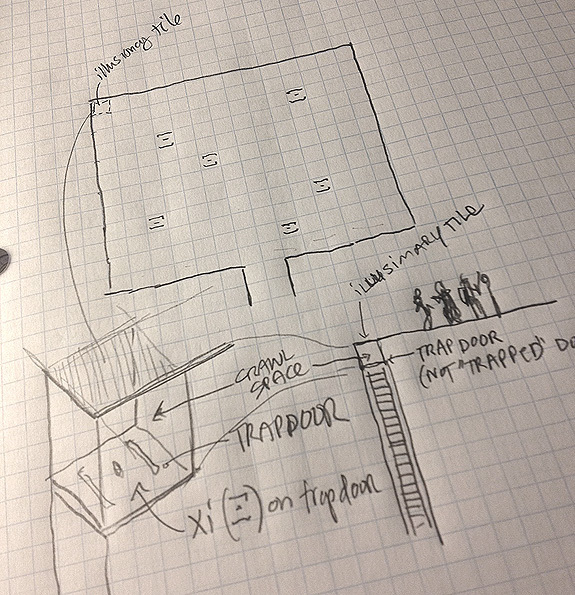 The bottom of the crawl space is 5'x5' tile engraved with the letter Xi ("Ξ"); this is a trap door that opens to a shaft with a ladder than extends straight down for 30'. The long walls of this gallery-like room are covered with über-realistically painted frescoes of cave exteriors and feature 12 different cave entrances (6 on each wall) each guarded by a neanderthal with a spear. The centerpiece of the room is a fresco on the far wall that depicts a primitive man making a painting of a mastodon on his cave wall in front of his family. The entrances to the caves painted on the side walls are actually teleportation "gates" and will transport those who enter to various spots around the catacombs. Roll 1d12: 1=Alpha, 2=Beta, 3=Gamma, 4=Delta, 5=Epsilon, 6=Zeta, 7=Eta, 8=Theta, 9=Iota, 10=Kappa, 11=Lambda, 12=Mu. The centerpiece fresco is an illusory wall and can be passed through directly to the next area. So, only 1 month ago, Valley of the Five Fires was shaping up to be about 48 pages. It is now entering its final stages and looks like it will come in at 56 pages. 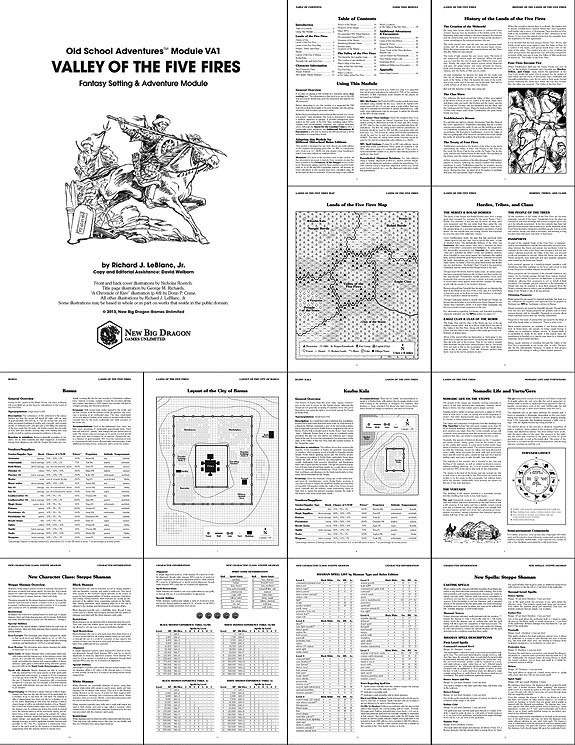 This includes the shaman class information, a new additional adventure (a location that once cleared becomes a suitable base of operations for the PCs), and a "handout" map for the players (the blank page in the layout below). The final 56-pager is almost double the originally estimated 36-page count from when I announced this back in January! this week I'll return to the regularly-scheduled A-to-Z posting. You exit the hallway to find a 30' wide by 115' long gallery stretched out before you. The vaulted ceiling goes from about 20' up on the sides to 30' high at the crest of the vault. At the far end of the room is a 10'x10' nook featuring a large stone statue of a medusa. Down each of the long walls are five paintings of medusae executed in various styles. The ten framed pictures are uniform in size and each measures approximately 6' wide by 8' tall. The paintings are hung simply from the wall using a hook (on the wall) and wire (on the backs of the paintings). Behind each of the paintings is a 5'x5'x5' nook. The nooks marked on the map with an "X" hold the head of a medusa. Anyone looking at one of these nooks (with the head) when the painting is removed must save vs. paralysis or be turned to stone. Since the head is "dead", the snakes are not alive and may not attack. Three of these nooks have a secret door in the back of the nook that accesses a 5' wide by 5' high crawl-way. The trap doors in these crawl-ways (indicated with "T" in a square) are disguised and anyone crossing them directly will fall into a 5' deep spiked pit, sustaining 1d4 points of damage in the process. You come to a "T" in the hallway. Looking down either direction (left or right) you can just make out the form of a motionless minotaur; each of the minotaurs bears a battle axe and seems to be on the small side... for a minotaur, that is. All of the statues in the labyrinth may depict minotaurs, but are actually living statues of stone (hp: 13 ea. ), that will become animated and attack when any living creature comes within a 10' radius of the statue. Any minotaur statue attacking from behind an illusory wall surprises on a 1-4 (on 1d6). The statues will not respond to "inanimate" objects (e.g., arrows, spears, etc.) that cross the threshold of the 10' radius, nor will they react to undead creatures (only "living" creatures). 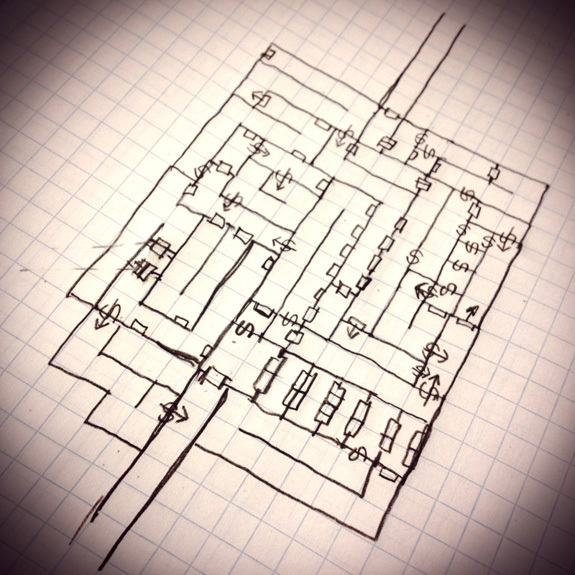 All of the levers in the labyrinth (except the trapped lever near the portcullis to the N) must be "switched" for the portcullis to the N to open. The level just to right of the portcullis is trapped (and is not related to the portcullis) and will drop a heavy stone from above, doing 2d4 to anyone standing underneath. Optional "Complication": Each lever for the portcullis may be determined as being in an "on" or "off" position when the PCs find it (e.g., roll d6; odd="off", even="on"). Switching the lever into the "on" position makes a grinding noise, and switching the lever into the "off" position makes no noise. All of the levers must be in the "on" position for the portcullis to open. Living Statue, Stone Minotaur: HD:4; AC:4; #AT: 1 gore/1 bite or 1 weapon; D: 1d6/1d6 or 1d8; M:9(3); ST:F/4; immune to sleep and mind-reading. 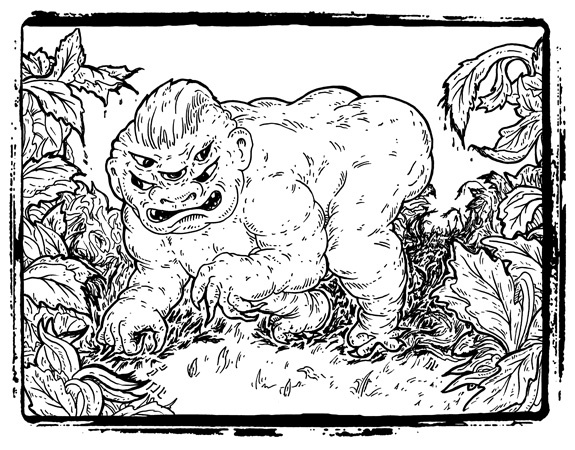 We interrupt this station's regularly scheduled A-to-Z posting to bring you the following illustration. 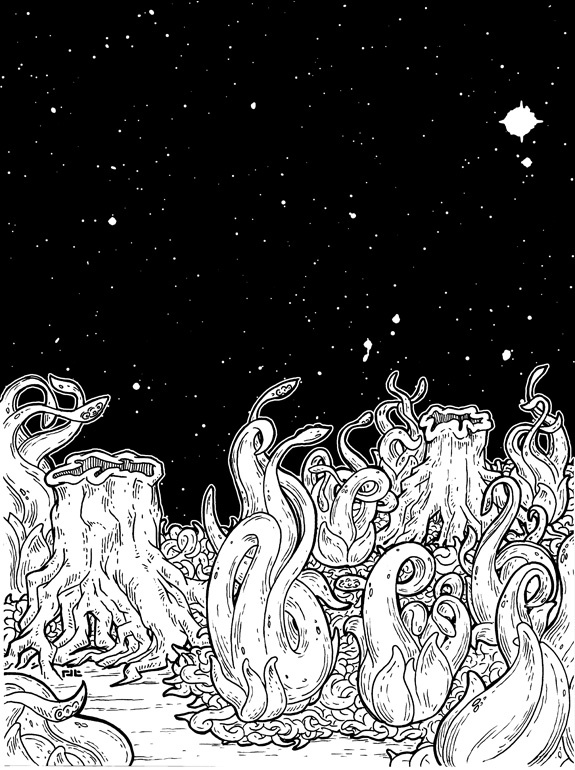 I started doodling last night and ended up doing this (below), which has now been contributed to the Petty Gods project. As you enter the room, what must easily a thousand little eyes carved into the walls of the room suddenly turn and stare directly at you. This room completely freaks you out. All characters entering the room must save vs. spells or flee the room in fear (duration: 2 turns). Closer and continued examination of the eyes (1 turn minimum) will reveal that some of the eyes may not “move” and are, instead, completely “static.” Each of these motionless eyes (there are 9 of them) is actually a button. It will take 2d4+3 turns to find all of the static eyes. 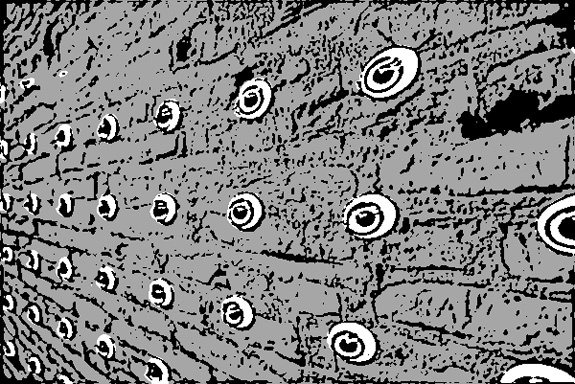 Once all 9 “eye buttons” have been depressed, a portion of the wall to the (east) will move away, granting access to the hallway beyond. The opening will remain as long as the eye buttons remain in their depressed posititon (any single button may be “released” by pressing it again). For every three turns spent in the room, each character (even those that have made previous successful saving throws vs. the eyes) must make another save vs. spells or flee the room in fear (duration: 2 turns). I know I've already made my A-to-Z post for today, but going back through my notes, I realized I had another Theta (Θ) entry. I figured, what the hell, I'll make a 2nd post and put it out there an alternate to the previous room. Honestly, in looking at the two now, I think this room is more interesting (and a real nuisance of sorts). At first, you think a clue is being revealed to you, but as the throne continues to jabber on, and then the three thrones join as a chorus, you realize they’re putting on a play. The play which the thrones are “performing” is The Bacchae by Euripides, a play based on the mythological story of King Pentheus of Thebes and his mother Agauë, in which they are punished by the god Dionysus for refusing to worship him. 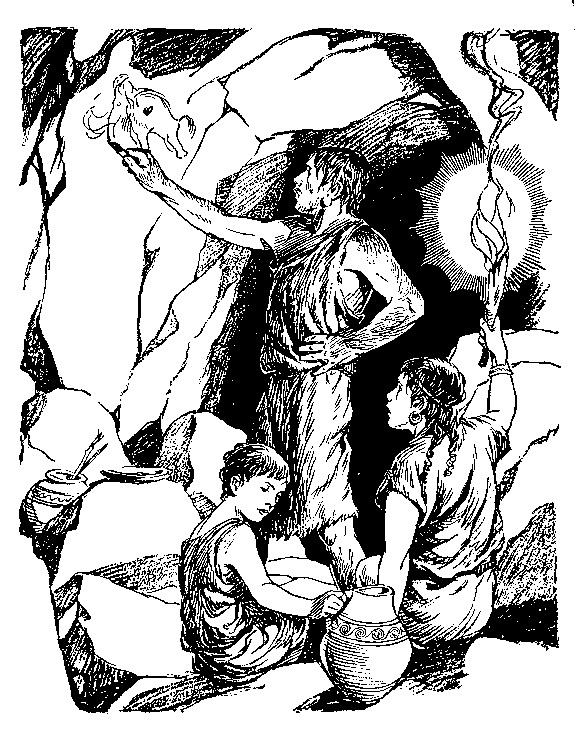 In the play, Cadmus (Kadmos) denies the young Dionysus a place of honor as a deity. The performance of the play (in its entirety) lasts approximately 1-1/2 hours. There is a magical door in the room that will be opened based on the following criteria: 1) once the characters have entered the room and the play has begun, at least one character must remain in the room and awake for the play to continue; 2) when the performance is complete (and only after the entire performance has been completed), all the characters in the room must applaud. If all the PCs exit the room or if all PCs who remain in the room fall asleep, the performance will cease, only to start over when the PCs re-enter the room or awaken. There is suddenly silence, as if the thrones are waiting for you to respond to their performance. If only some of the PCs in the room clap, one of the faces on the thrones will smile and the other two will look at those PCs who aren’t clapping (or are asleep) with grimaces of disapproval and disgust. Once all the PCs in the room (including those that may have been asleep) have clapped sufficiently (at DM’s discretion), the magic door will open. If no one claps upon the completion of the performance, the play will begin again after 1 turn (assuming there are PCs awake in the room). Once started, the play must be completed entirely for the chance of opening the magic door (from applause). 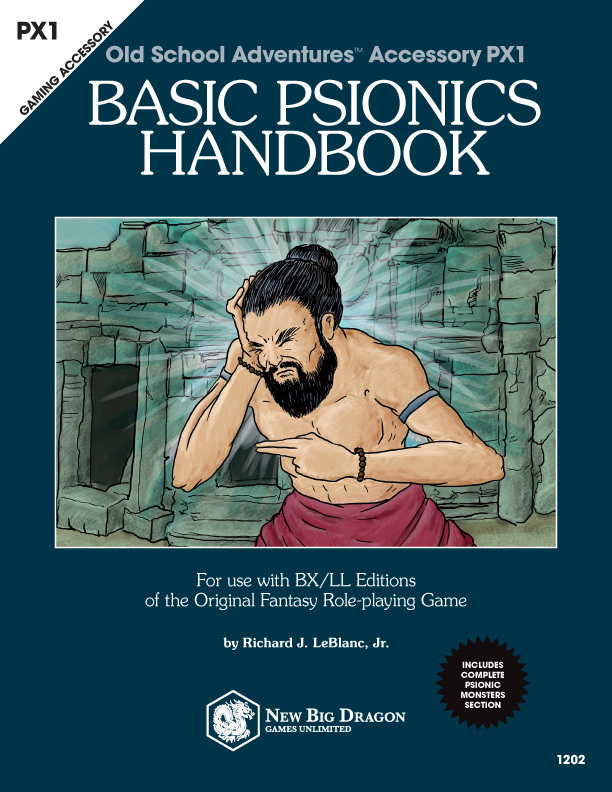 EDITOR'S NOTE: It is highly suggested the DM actually read the play in its entirety, placing the the same requirements of the actual players in the room as the PCs in the game (i.e., they must remain awake and in the room, applaud at the end, etc.) for the play to complete and the magic door to be opened for the PCs in the game. Before you lays a 50'x50' room with a floor composed of 5'x5' tiles. Each of the tiles bears one of three symbols: an "X" in a circle, a "plus sign" in a circle, or a horizontal like through the middle of a circle. Opposite the entrance is a doorway into another hallway. The floor tiles are teleportational in nature. Any creature walking through the room must step on a series of contiguous tiles in the correct order, or be returned to the hallway on the south side of the room; the magic will put the teleported individual in the "next closest open space" in the hallway (that is, it will not put the individual inside a wall or another creature). The correct order of procession across the tiles matches the development of the Greek letter Theta (Θ) from it's most archaic form (the Phoenician letter "teth") to it's most advanced form (progressing from "X-circle" to "plus-circle" to "horizontal-line-circle"), then repeats the pattern. Since the contiguous pattern cannot be followed into the opposite hallway, the only safe way to traverse the room is to walk the pattern of tiles over to the secret door along the eastern wall. If characters make it near the other side of the room, they may attempt a broad jump over the remaining 3 tiles. Given that even the strongest, most agile human is only able to broad jump to a distance of 10-11', clearing this distance under normal circumstances should be considered impossible (causing the character to be teleported back to the entrance). Note: Although eta is the seventh letter of the Greek alphabet, it has a numerical equivalent of 8. Sigma (with a numerical equivalent of 6) breaks the numbering between epsilon (5) and zeta (7). The hallway starts to widen suddenly, forming a large, trapezoidal-shaped room, approximately 80' across (from the mouth of the hallway to the far wall) and 80' long at the "wide" end. Standing along the far wall are 8 statues (each about 10' tall); in front of each statue seems to be a hole in the floor. The granite floor of the room features a sunk relief of a sundial that either measures out two hours or ten minutes; you can't immediately tell which. Each of the statues is dedicated to one of the gods. 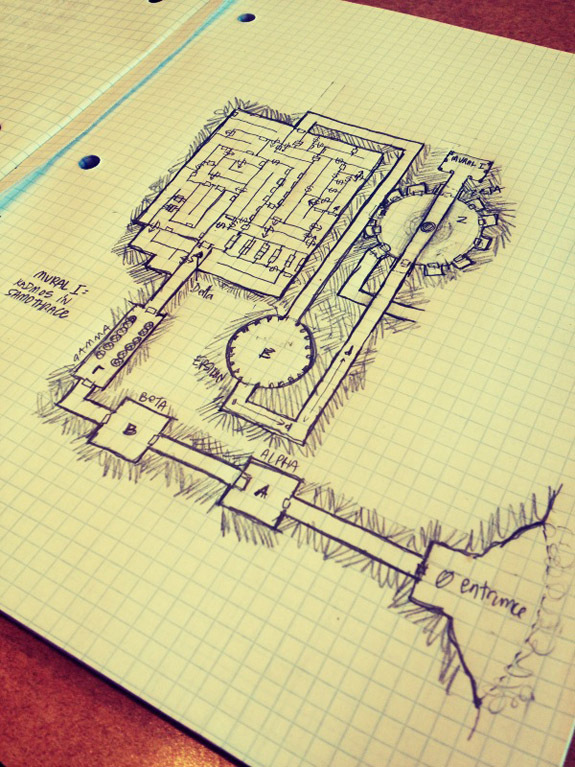 Each hole is approximately 6' deep and is wide enough for a large human (or small half-orc) to stand inside. Standing in the hole for 10 minutes and praying to the deity in front of the hole will bestow a blessing upon the person praying. The blessing for each hole takes 2 hours, once granted, to "recharge" (e.g., after 10 minutes of praying, it then takes 2 hours for the hole to fully recharge, then the next ten minutes of praying may begin). Optional side-effect: Clerics (and all other clerically-classed characters including druids and paladins) choosing to pray in any of the holes will lose all of their clerical/class abilities (returning them to "0-level"), unless the deity to which they are praying is their patron deity. This statue depicts a handsome, beardless young man holding a bow in his hand. The base of the statue labels this figure as "ΑΠΟΛΛΟ." Praying in this hole for ten minutes will cure light wounds (as cleric spell). This statue depicts a striding winged man, his hair and beard spiked with ice. The base of the statue labels this figure as "ΒΟΡΕΑΣ." Any character that enters this hole will feel a slight chill. Praying in this hole for ten minutes will grant the ability to resist cold (as cleric spell) for a 6-turn duration. This statue depicts a buxom woman reclining upon the earth surrounded by a host of carpi (infant gods of the fruits of the earth). The base of the statue labels this figure as "ΓΑΙΑ." Praying in this hole for ten minutes will grant the supplicant a boon of 200 experience points. This boon may only be granted once to a single character, and takes the normal 2-hour recharge period. This statue depicts a bearded and robed mature male holding a fennel staff tipped with a pine cone. The base of the statue labels this figure as "ΔΙΟΝΨΣΥΣ." Praying in this hole for ten minutes will give the character a slight sensation of "drunken euphorea", but will grant immunity to fear for a duration of 6 turns. This statue depicts a bearded and robed mature male leaning against a stump, around which is curled a long snake. The base of the statue labels this figure as "ΕΡΕΒΥΣ." Praying in this hole for ten minutes will make the character immune to poison for 6 turns. This statue depicts a woman standing in a chariot bearing the symbol of a crescent moon. The base of the statue labels this figure as "ΣΕΛΕΝΕ." Praying in this hole for ten minutes gives the character the ability to detect magic (as cleric spell) for a duration of 6 turns. 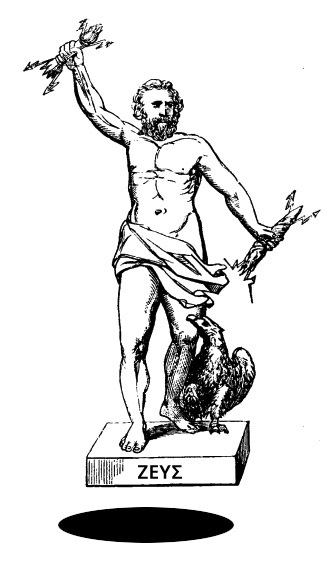 This statue depicts a bearded man holding lightning bolts in his fists, and an eagle at his feet. The base of the statue labels this figure as "ΖΕΥΣ." Praying in this hole for ten minutes gives the character the ability to detect evil (as cleric spell) for a duration of 6 turns. This statue depicts a solemn, majestic woman holding a scepter culminating in a pomegranate. The base of the statue labels this figure as "ΗΕΡΑ." Praying in this hole for ten minutes grants the supplicant protection from evil (as cleric spell) for a duration of 6 turns. The pomegranate may "spun" clockwise to open the secret door on the wall just to the right of this statue. Turning the pomegranate counter-clockwise will close it. 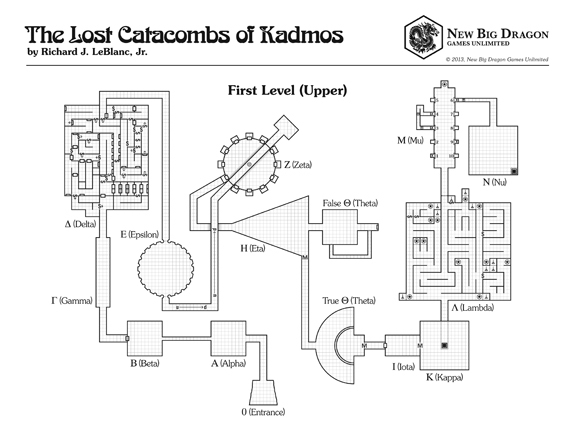 This is simply a Week 1 recap for The Lost Catacombs of Kadmos (my 2013 A-to-Z blogging challenge concept). Also, just a reminder that I'm going in the order of the Greek alphabet, not the Latin alphabet, so it's really more like a "Α-to-Ω Blogging Challenge" for me. 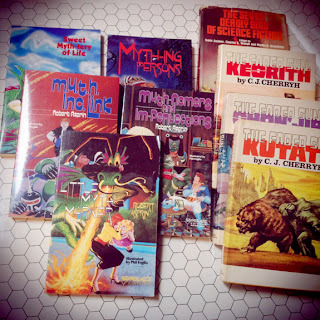 Today, my wife and I decided to hit a few estate sales in our neighborhood. 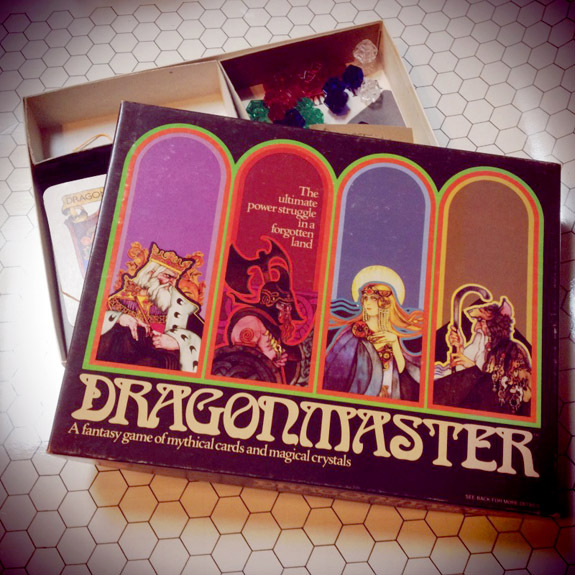 I walked into the first of these and saw a table stacked with binders with Illuminati cards and vintage box of Grenadier Wizards & Warriors minis; the box turned out to be empty, but gave me hope that a gamer lived here and there was treasure somewhere in the house. Then, in what appeared to be the home office, I found the hex/grid battle map (the hex side is pictured here, but the recto side has similarly-sized square grid). I also found a certificate of some sort for Rex A. Zinn. "Who was this Rex A. Zinn," I wondered. Then, upstairs I found this (below)—and complete at that. This is something I've kind of been wanting for a while, but had not made any concerted effort to acquire. So back to the topic of this post... "Who was this Rex A. Zinn?" 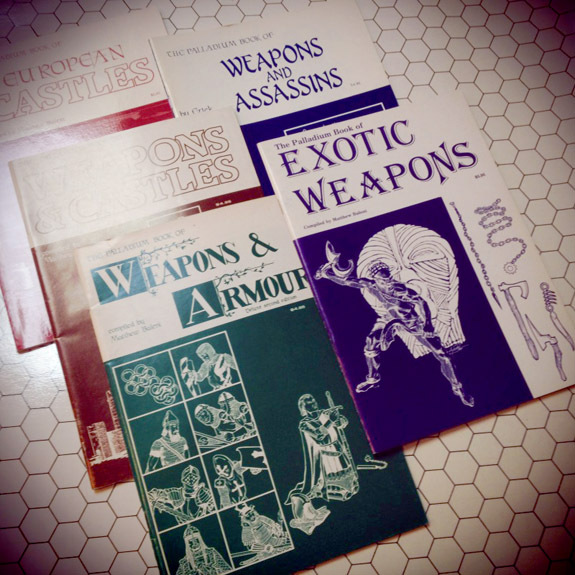 I know that in the bigger scheme of things, Mr. Zinn's gaming legacy isn't as big as some, but his death also pre-dates the old-school renaissance and the explosion of gaming-related blogs. I wonder if we would have heard more from him had he lived longer. If you know another "minor" gaming figure that is no longer with us, please feel free to leave their name and a bit about them in the comments section below. Looking down into the room below, you find a large circular diagram inlaid on the floor. 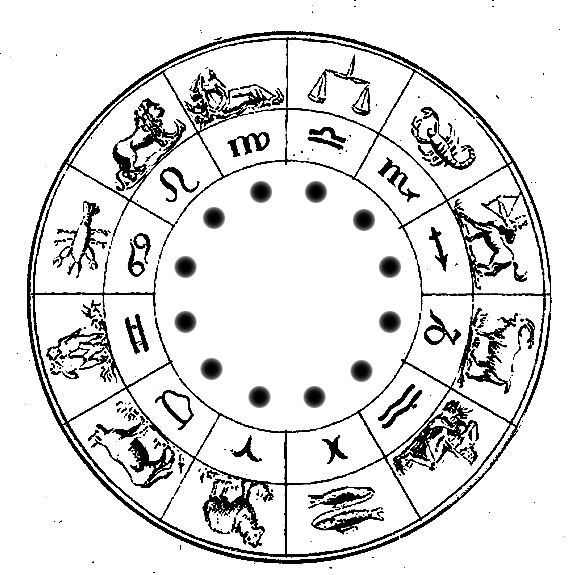 The center of the diagram is placed directly under the center of the hole above (from which you look down), and the circle is divided into 30° segments, each of which features a symbol/illustration pair, with a small circular depression set just below them. As you enter the room from the hole above, you find yourself in the middle of a domed stone room 60' diameter, and with a 30' tall ceiling. The outer wall is lined with 12 iron doors, each 30° apart and roughly corresponding to one of the symbol segments of the diagram on the floor. Furthermore, the center of each door features an engraving (about 4" in height) of that corresponding symbol. Behind each door is a zombie (hp:6 ea.) that wears a gold amulet bearing the symbol corresponding to its door/segement. Each of the amulets (worn by the zombies) can be placed in the corresponding depression on the floor diagram. 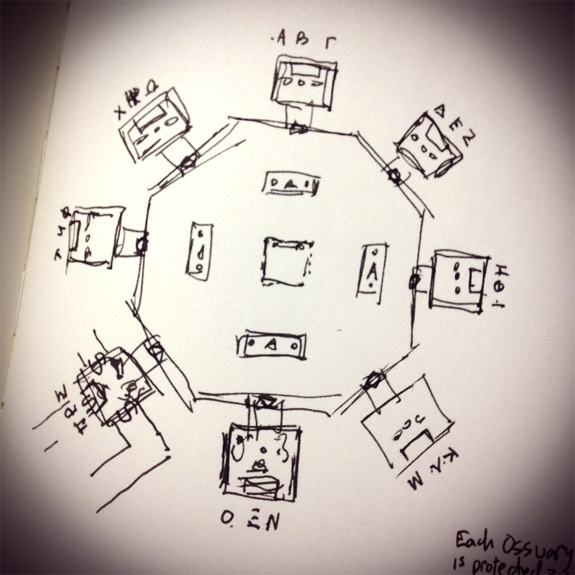 If all 12 amulets are laid in their correct place, the domed ceiling will magically become a planetarium. The placement of the stars on the ceiling will be that as they would appear outside if it were night time at that very moment in that location, moving in the “night sky” as normal. The effects will cease when any amulet is removed from the floor. Each amulet is worth 50gp. The amulets have nothing to do with exiting the room. 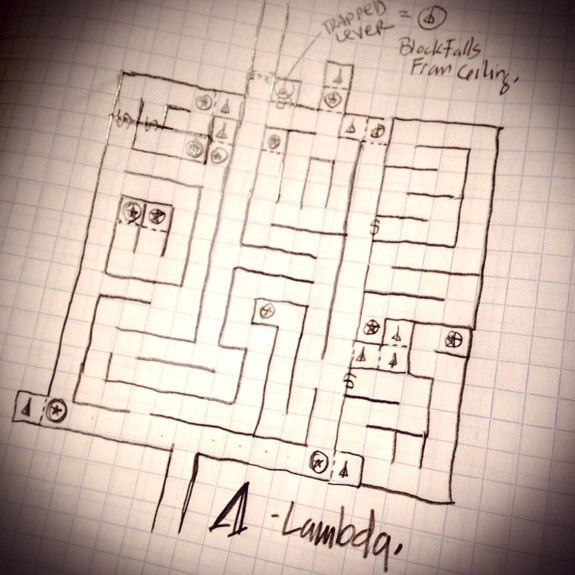 Instead, there is a secret door inside one of the “zombie closets” (as indicated on the map*). 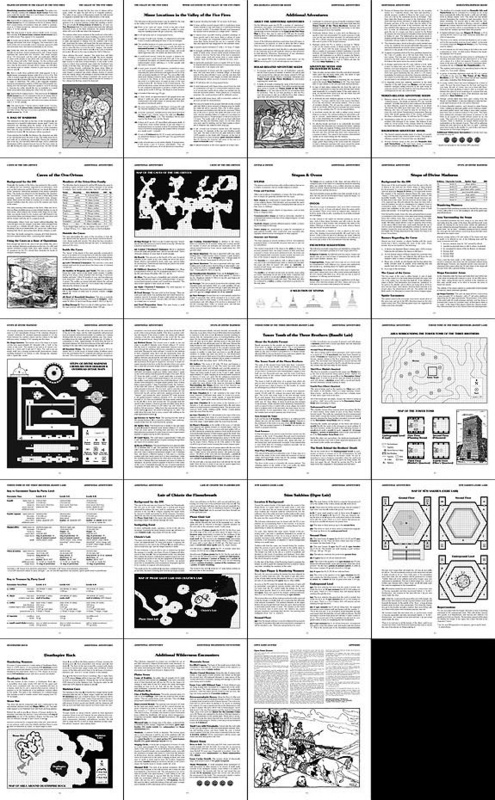 *Complete map of catacombs to be published at a later date. 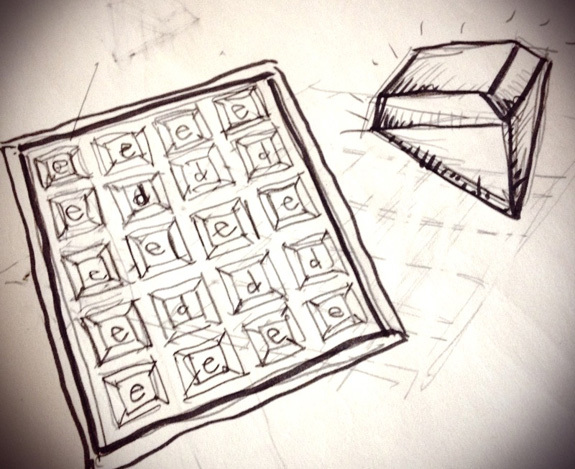 Removing any single jewel (diamond or emerald) from the tray will cause the entrance to disappear, and be replaced by wall similar to the rest of the room. Removing all of the diamonds from the tray will cause the wall between the columns opposite the entry to disappear, allowing access to the next hallway. The original entrance to the room may only remain open if all of the emeralds and diamonds are placed back into the "E-shaped" pattern; they do not have to be "exactly" where they were; any diamond may be placed in any diamond "slot" and any emerald may be placed in any emerald "slot." Each emerald is worth approximately 1,000 gp. The diamonds are relatively flawed (with some inclusions and mild discolorations) and are worth about 2,500 gp each. You come to a small, unassuming wooden door. Set upon the door is a small brass plaque (approximately 9" tall), which is engraved to resemble the door your viewing, plaque and all. THe detail of the plaque on the engraving of the door appears to be that of a yet smaller door and smaller plaque. Closer and closer examination of the engraving reveals what appears to be an infinite number of “doors within doors” on each susccessively smaller plaque in the engraving. The first door opens easily, revealing the next set of doors. This area of the catacombs is simply a labyrinth of doors (secret, one-way, false, etc.) to be navigated by the PCs until they reach the next area. The first things you notice about this 10' wide by 60' long room are the low ceiling (barely 8') and the statues of the gargoyles lining the two long walls. The 6 statues on each side are spaced roughly 5' apart, and strangely face away from the center of the gallery (they face the walls with their backs turned toward the middle of the gallery), in an identical hunched and squatting position. They are each supported by a pedestal approximately 6" tall and 3' in diameter. 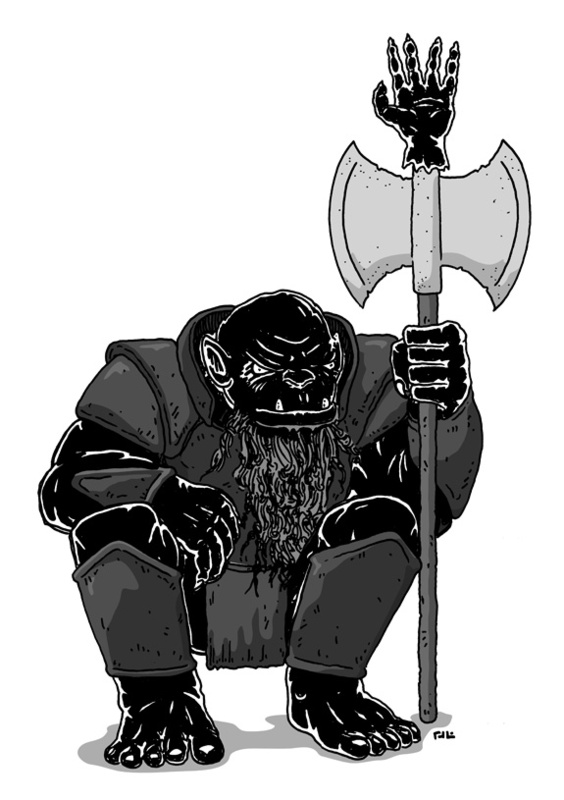 There is room for only one person of human size or dwarven build to pass between them at a time, although 2 halflings, gnomes, or slender elves could probably fit at one time if so desired. Explosive gas: If a torch is present between statues when gas is emitted, a saving throw must be made (by the torch-bearer) or the gas will combust, causing an amount of fire damage (to all in path) as indicated in parentheses for the gas. If there is no torch present in the path, or if the saving throw is successful vs. the combustion, creatures in the path (between the two statues) must make a saving throw vs. breath weapon or fall unconscious for 1 turn. 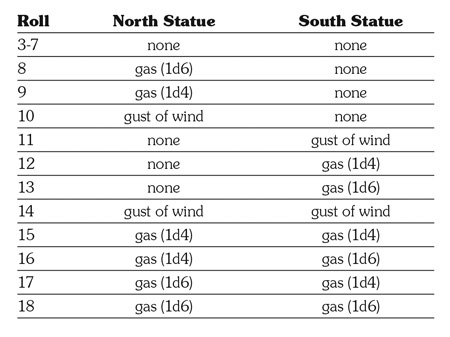 Gust of Wind: If a torch (or unprotected flame) is present between the statues when a gust of wind is emitted, there is a 50% chance the flame will be extinguished if one statue emits the wind, and a 90% chance the flame will be extinguished if both statues emit wind. Moving/Turning the Statues: The stone statues each require a combined strength of 21 to move them. 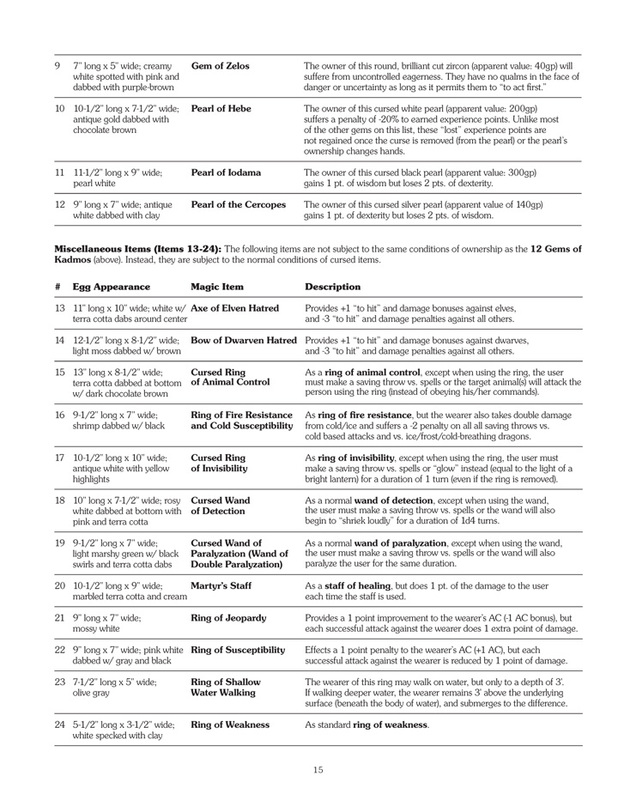 Additionally, they are particularly top-heavy; if the players attempt to move or turn the statues, the chance of the statue “toppling” is equal to the number of persons assisting on 1d6 (for example, 1-2 on 1d6 if 2 people are attempting to move/turn the statue). Should a statue be toppled, there is a 50% chance it will explode, doing 4d6 damage in a 15' radius. Jumping/Crawling Past the Statues: Crawling past the statues reduces all damage (on failed saving throws) to half, as well as halving the chances of extinguishing flames. Trying to “jump” or “fly” over the walkspace between the statues (e.g., if a human “tosses” a halfing) reduces all damage (on failed saving throws) to half, as well as halving the chances of extinguishing flames, but there is a 10% chance of toppling one of the statues in the process (chances of resulting explosion as above). The walls, ceiling, and floor of this 30'x30'x30' cube of a room are lined completely with alabaster of bright white. Planted against the north wall is a 5'x5'x5' cubed pedestal of the same alabaster, topped by a 5' statue of an asp carved out of a deep blue azurite, its mouth agape, and its two massive fangs carved out of the same white alabaster as the room. The walls to the west and east each feature an alabaster relief sculpture of an arched door surrounded by dozens and dozens of alabaster asps. The relief to the west features the letter alpha (Α) carved squarely in the middle of its scuplted door, and the relief to the east features the letter omega (Ω) carved squarely in the middle of its scuplted door. On the floor in the middle of the room is a 5'-tall azurite inlay of the letter alpha (Α). The archways are simply “false” doors. Examining them will reveal nothing more than what they appear to be). Try as the PCs might, there is no way for the them to "open" these doors or pass through them. The soft alabaster of the reliefs will give in easily to damage (5 hit points required per relief) and reveal nothing but the stone base of wall underneath them. The letter inlaid on the floor is actually a clue to exiting the room, as it points directly to the pedestal under the asp statue. when both of the asp’s fangs are depressed (upward) at the same time, the front panel of the panel of the pedestal will “slide down” out of the way. However, when the fangs are pressed (even lightly), they each release a poison that kills in 2d4 turns (unless a successful saving throw is made vs. each fang). The fangs are razor sharp and will break through leather gloves effortlessly, but may be depressed easily using any common object (like the blade of a sword, or the edge of a shield). 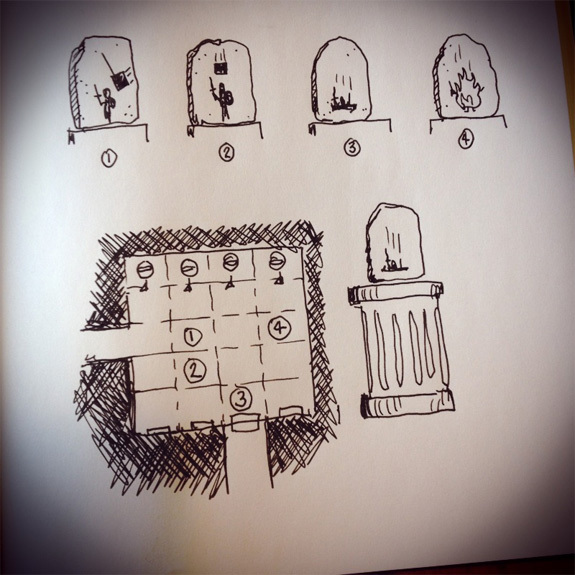 The alabaster of the pedestal is soft enough for the characters to “dig” through (10 hit points damage required), but the pedestal and statue will collapse in the process, falling “forward” toward where the breakage occurred, doing 1d4 points of damage to the person standing closest to the pedestal, and with a 15% chance of each fang make a successful "hit" against that person.